Time delays: Trying to brainstorm with someone in real time via email is just about impossible when the person is located in a different time zone. Waiting several hours for a response, in other words, can slow down a conversation and impede progress. A lack of security: One of the biggest downsides to email communication is that it’s easy to send a message to the wrong person. In doing so, an entire chain of sensitive information could be opened up to someone outside of the organization. This is especially dangerous if there is sensitive proprietary information that could result in a data breach, or a major loss of revenue if leaked to a competitor. The fact is that email should be reserved for basic communication among employees, and for notifications. If your business is still using email for collaboration purposes, it’s time to migrate to an advanced online meetings platform that can facilitate high-quality interactions. Online meetings provider Onstream Meetings, for instance, facilitates cutting-edge online collaboration sessions using features like screen sharing among remote end users; real-time document editing tools; and audio, video and text-based chat solutions. 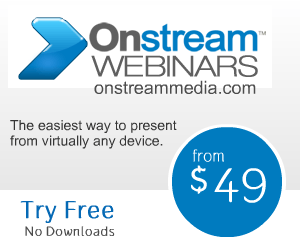 You can learn more about how Onstream can transform your business’s online meetings by clicking here.